LIMA, Peru (AP) — Peru's government has restored the independence of an agency charged with combating illegal logging after facing potential U.S. sanctions. BEIJING (AP) — Chinese and U.S. negotiators adjourned trade talks in Beijing on Friday with U.S. Treasury Secretary Steven Mnuchin saying they had been "constructive." WASHINGTON (AP) — Top U.S. trade and economic officials will visit China late next week for another round of negotiations, a White House official said Tuesday. BEIJING (AP) — U.S. and Chinese negotiators opened talks Thursday on a sprawling trade dispute as Beijing reported its January exports rebounded despite President Donald Trump's tariff hikes. BEIJING (AP) — U.S. and Chinese negotiators began trade talks Thursday that President Donald Trump says will help decide whether he escalates a fight over Beijing's technology ambitions by raising tariffs on $200 billion of imports from China. WASHINGTON (AP) — The Senate's top Democrat is introducing legislation to "hold China accountable" and sanction laboratories and other traffickers who export fentanyl to the United States. WASHINGTON (AP) — President Donald Trump says he does not expect to meet with Chinese President Xi Jinping (shee jihn-peeng) before a deadline to resolve a trade dispute. WASHINGTON (AP) — There are no plans yet for President Donald Trump and Chinese President Xi Jinping to meet soon in hope of finalizing a trade deal, Treasury Secretary Steven Mnuchin said Wednesday. Mnuchin and trade representative Robert Lighthizer are leading a team to Beijing next week to continue the talks, but nothing is yet on the books for a Trump-Xi meeting. 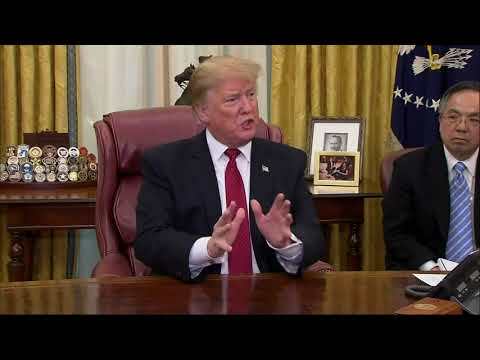 WASHINGTON (AP) — President Donald Trump on Thursday talked up China's commitment to buy more American soybeans. But the tough issues dividing the world's two biggest economies remained unsettled after two days of meetings between U.S. and Chinese negotiators. Trump said he expects to meet with his Chinese counterpart, Xi Jinping, to try to reach a final resolution to the six-month trade standoff. U.S. Trade Representative Robert Lighthizer (LYT'-hy-zur) says "substantial progress" has been made as American and Chinese negotiators wind up two days of trade talks in Washington. The two sides are trying to make progress toward a deal by a March 1 deadline. That's when U.S. tariffs against Chinese goods are scheduled to bump up to 25 percent from 10 percent. WASHINGTON (AP) — U.S. and Chinese negotiators are holding high-level talks aimed at settling a six-month trade war that has weakened both sides, shaken financial markets and clouded the outlook for the global economy. Trump tells reporters that "we've really had a very extraordinary number of meetings and a deal could very well happen with China." U.S. Trade Representative Robert Lighthizer (LYT'-hy-zur) and China's economy czar, Vice Premier Liu He, are expected to hold talks at the end of January. BEIJING (AP) — The top U.S. and Chinese trade envoys will hold talks in Washington this month in a possible sign of progress toward ending a costly tariff battle over Beijing's technology ambitions. WASHINGTON (AP) — The White House has named the members of a scaled-back delegation that will represent the Trump administration next week at an annual economic conference in Switzerland. President Donald Trump had planned to attend the World Economic Forum in Davos, but canceled his trip because of the partial government shutdown. LIMA, Peru (AP) — The top U.S. trade official on Friday took a first step toward potential sanctions on Peru for allegedly violating environmental protections aimed at combating illegal logging, a case that could have ramifications for the new North America free-trade deal. LIMA, Peru (AP) — The top U.S. trade official contends Peru's government is not living up to its commitment to combat illegal logging in a case that could have broader implications as Washington debates ratifying a new North American free trade deal. In a letter sent Dec. 21 to a congressman, U.S. Trade Representative Robert Lighthizer said he considered it "unacceptable" that Peru recently decided to move an independent agency monitoring the logging trade under the Environment Ministry. BEIJING (AP) — China's economy czar and U.S. trade envoys discussed plans for talks on a tariff battle, the government said Tuesday, indicating that negotiations are going ahead despite tension over the arrest of a Chinese tech executive. As President Donald Trump ponders picking a new chief of staff, more names are emerging as possible contenders for the job. A person familiar with Trumps' thinking tells The Associated Press that among the four people being considered by Trump are the White House budget chief, Mick Mulvaney, and a Republican congressman from North Carolina, Mark Meadows. ABC's "This Week" — Sens. Marco Rubio, R-Fla., and Chris Murphy, D-Conn.
ABC's "This Week" — White House economic adviser Larry Kudlow; Sens. Marco Rubio, R-Fla., and Chris Murphy, D-Conn.
WASHINGTON (AP) — House Democratic leader Nancy Pelosi is suggesting Congress may not pass the new trade agreement reached by the United States, Canada and Mexico if labor and environmental provisions are not strengthened. Pelosi says "there are positive things in this proposed trade agreement," but it doesn't include "real enforcement of the labor and environmental protections." She met Thursday with the U.S. Trade Representative Robert Lighthizer.